Shrewsbury turned out to be an inspired choice for the location of our 2017 Annual General Meeting held on Saturday 6th May at the University Centre. The meeting was well attended with the highest number of members present for several years as well as a number of guests and friends. It was very encouraging that we had a mixture of both local members, who had not previously attended an Association event, and two members from Australia, so literally from near and far. The meeting received the Trustee’s Annual Report which detailed our activities in the calendar year 2016. The minor constitutional changes proposed were passed unanimously and will be implemented from the next AGM. There were no changes to the officers or trustees with Miranda Malins and Jonathan Fitzgibbons both elected to serve a further three year term. There followed a discussion of the future of Cromwell Day Services in the light of the continuing difficulty of accessing Cromwell Green. The consensus view was that the closest Saturday to 3rd September would be an acceptable date for future services, and that the membership was not averse to the service being held outside London, possibly with an accompanying programme of events. 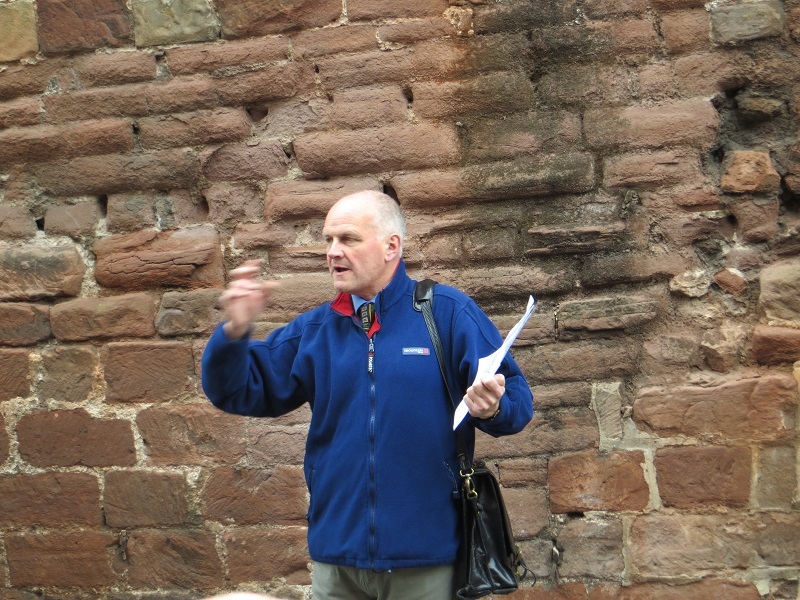 Following the meeting Dr Jonathan Worton gave an illustrated lecture of the Civil War in Shrewsbury which was excellent preparation for the guided walks given in the afternoon led by Dr Worton and our President Professor Peter Gaunt . Both groups met and the afternoon concluded in the café at Shrewsbury Museum. During the day over £200 was raised from the raffle and a sale of donated books, all of which will help to off-set the running costs of the Association. Thanks to Peter Gaunt for organising a successful day. The 27th June saw our third Teachers Day, although the first one in Oxford. 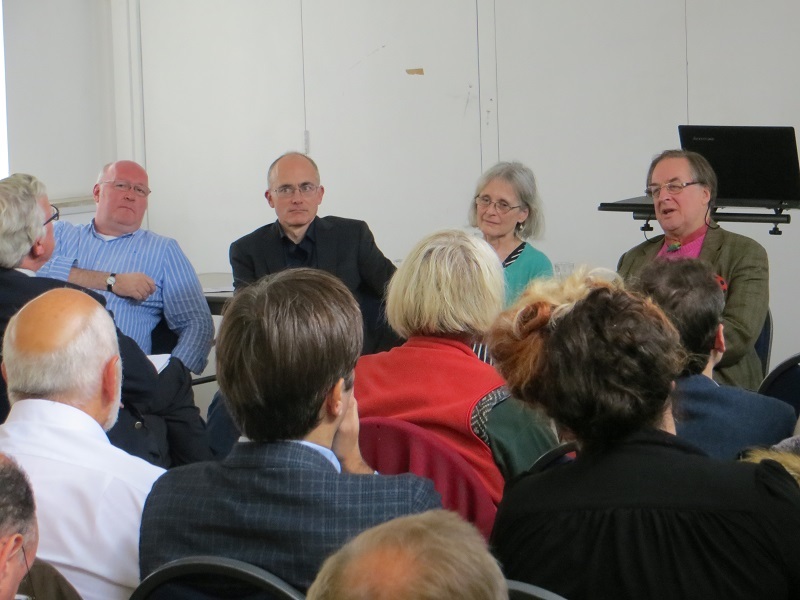 We gathered in the impressive Tsuzuki lecture theatre in St Anne’s College to hear Professor Ronald Hutton, Dr Elaine Murphy, Professor Ted Vallance and Professor Ann Hughes debate three questions around Oliver Cromwell’s life and career. 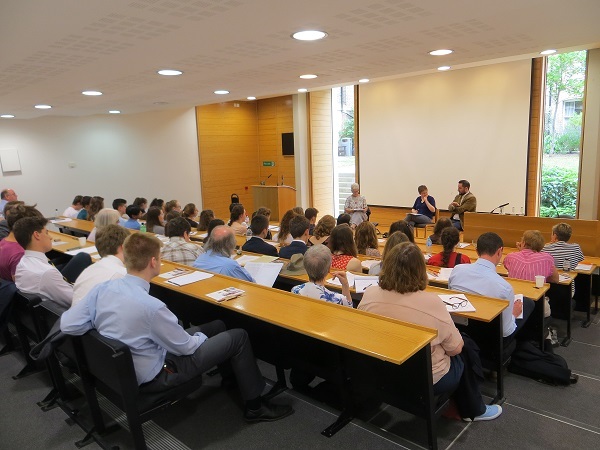 The audience of about 60 was made up of A level teachers and year 12 students (plus a few Association members) who listened carefully as Ronald and Ted discussed whether Cromwell became Lord Protector to return England to political stability. The consensus of the first debate broke down a little in the second session which asked why modern historians often disagree with the contemporary view of Cromwell as a hypocrite; Ann and Ronald had very different ideas as to why this was, and expressed their views with great fluency and passion. The third debate asked, controversially, whether Cromwell should be deemed a war criminal. The debate between Elaine and Ted was fiery and passionate and the students loved it! The audience heard lively debates about the life and career of Oliver Cromwell. St Anne’s served a fine sandwich lunch and the afternoon session was an open forum. The panellists talked about university applications at their respective institutions and then various students asked a number of very intelligent and taxing questions. The panellists were very impressed by the quality of the students’ questions, which showed huge interest and understanding. With luck, this is a very good omen for the future of 17th century history at Universities! Listen to the Teacher’s Day lectures here. 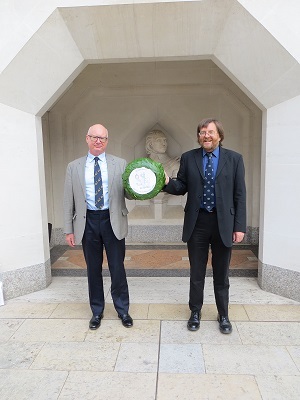 The anniversary of Cromwell’s death has traditionally been marked by the Association with a service of commemoration by the statue of the Lord Protector on the green outside the Great Hall of the Palace of Westminster. This year, as a consequence of extensive restoration work at the Palace, it was impossible to hold the service there. St Giles’ Cripplegate situated in the centre of the Barbican development on the north side of the City of London, provided a fitting alternative. It is the church where Oliver married Elizabeth in August 1620. Our service conducted by the Rev. Tim Woolley, after a welcome from the incumbent the Rev. Katharine Rumens, was enjoyed by all, and the accompanying organ music helped to add to the occasion. 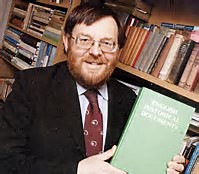 The address was given by Dr Stephen Roberts, a vice-president of the Association, and will be published in a forthcoming edition of Cromwelliana. A very welcome addition to the event was the serving of tea and cakes at its conclusion and the presentation of prizes to the winners of this year’s essay competition. A wreath was laid by the foot of the bust of Cromwell. Our service normally concludes with the laying of a wreath on the Cromwell statue; this year a wreath was laid before the service by the foot of the bust of Cromwell under the loggia of the Guildhall Art Gallery a few minutes’ walk from St Giles’, under the watchful eyes of the local constabulary. 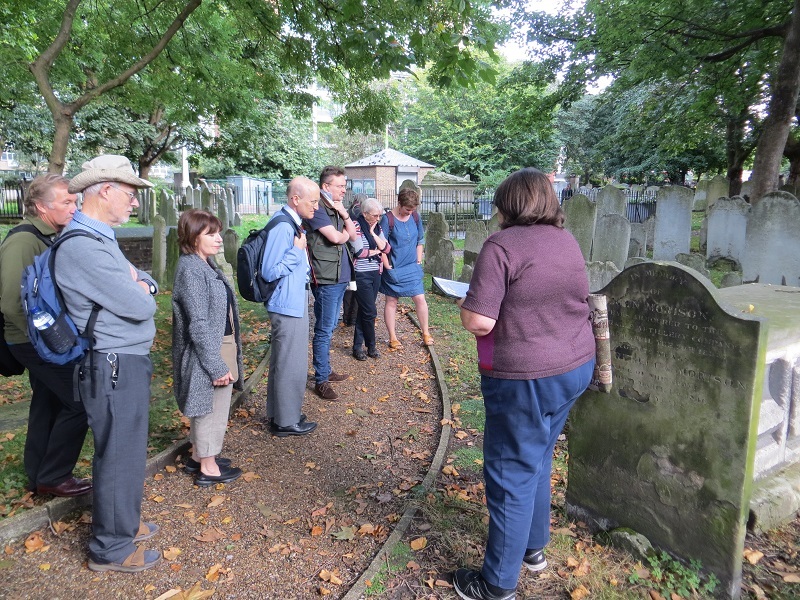 On the morning of the service a group visit had been arranged to the Bunhill Fields Burial Ground, which is the final resting place of a wide range of non-conformists, some well-known including Daniel Defoe and William Blake, and some descendants of Oliver Cromwell. The two guides who led the tours were full of useful information about the Burial Ground and its inhabitants. A decision on the venue for Cromwell Day, 3rd September 2018, or the nearest appropriate Saturday thereto, has yet to be made. What is unfortunately certain is that we will not be able to return to the Palace of Westminster in the foreseeable future. The theme of Cromwell and Europe seemed to be very timely as Brexit dominates the news pages, and looks likely to do so for some time to come. For many people the suggestion that Cromwell could have been anything other than an instinctive Brexiteer is perhaps challenging, but to try and pose questions as to how Cromwell would have responded to any modern issues is fundamentally flawed and pointless. That does not mean that it is pointless to examine Cromwell’s attitude to Europe, and that is what we did. Papers included an introduction to the Thirty Years War, an event which was well reported in this country at the time and an overall look at Cromwell’s attitudes to Europe and how he engaged with it (despite the fact that he never set foot in mainland Europe) which provided very useful context. Detailed studies of three different aspects followed with contributions on the Piedmont, Switzerland and the Netherlands. 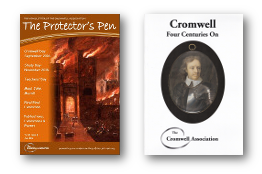 Many thanks to all our speakers who have all agreed to contribute versions of their papers to Cromwelliana for publication. On a less positive note it was disappointing that the event was not as well attended as some of our recent Study Days. Various reasons have been suggested as to why this may have been the case; choice of topic, choice of venue, cost, time of year, all of which may have contributed to the low turn-out. Council will bear all of these in mind when planning future events. We need to ensure that they are both credible and financially viable, and hopefully well supported.